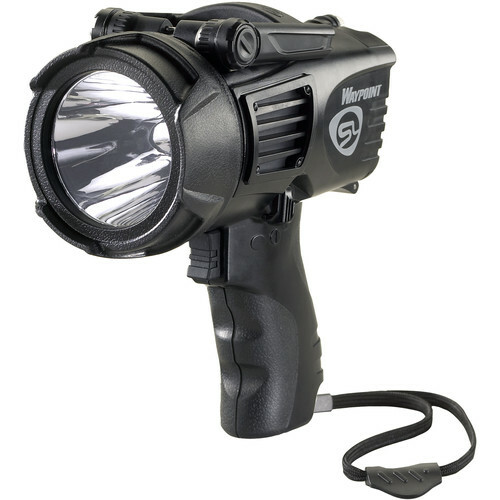 With its ergonomic pistol-style handle, searchlight-like beam, and rugged construction, the black Streamlight Waypoint Pistol-Grip Spotlight is ideal for extensive search missions. The light boasts 550 lumens of maximum output that should provide enough light for most of your lighting needs. If you want to conserve battery life or if you need less light, this device also offers a low illuminating mode as well as emergency beacon mode. If your application or task requires hands-free stationary illumination, the spotlight also has a built-in retractable stand. The impact-resistant C4 LED produces bright white light and has a power regulation circuit that maximizes brightness throughout battery runtime. Its parabolic reflector is optimal for creating a nearly parallel beam with a less bright peripheral cone of light. Use the trigger-style switch to turn on/off and the secondary rotary switch to change the modes. The housing is made of lightweight yet durable polycarbonate. It is sealed with an O-ring to offer water-resistant performance. Beyond this, its shock proofing does not lag behind. Its housing and polycarbonate lens are extremely durable and resistant to drops from up to 3.3'. Also included is an adjustable hand lanyard.